This week we will be meeting up at Malone’s at 19.00/19.30. Address: 608 West Pender Street. On Wednesday’s West Trek organizes their Wolfpack reunion for the Rockies trip there and we are going to join them! Why you ask? Well, we just want you to get a glimpse of what this tour has to offer, and what a crazy amount of fun it will be to join this trip with INTERNeX. There will be several guides whom you can ask everything you have always wanted to know about the tour and these famous mountains. Not only will we be going to Malone’s because of the Rocky Mountains trip. 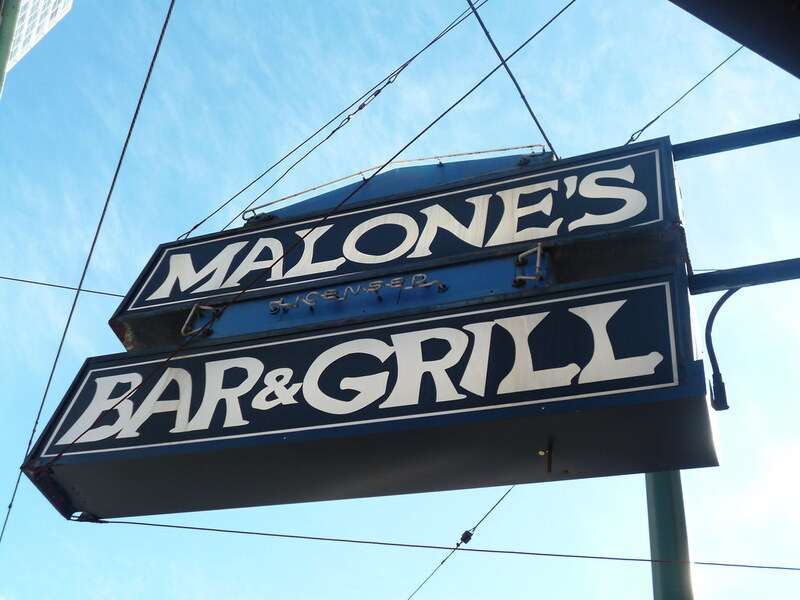 Malone’s is a great place to meet up with friends and they serve good beers and food. This night there will be a burger and beer combo on special for only 15 (fifteen yea) bucks!! And from what we have heard, the burgers are finger licking good. Anything else? Nope, that’s all. See you guys tomorrow! Russel Crowe once said: “I have respect for beer”. And who has not? Let’s put that respect into practice on tomorrow’s pub night. We would love to take you to The Morrissey on Granville and Davie St. (1227 Granville Street) this Wednesday at 7.30 p.m.
And many more beers enjoy. And, we have been thinking.. Guys, bring your ultimate travel photo, which holds a great story, and be ready to share it! We’ve got some new faces in our group and it would be nice to get to know each other a little better, wouldn’t it? Have you ever thought about the fact that there are 168 hours, 10,080 minutes or 604,800 seconds in one week? And what would you say, how many of these hours, minutes and seconds in this week did you actually spend on doing something you really enjoyed? I know, there’s always work or a job hunt or simply a lack of money in the way but at some point, we all have to actively make a decision for joy. It doesn’t just come to you like spam emails. Luckily enough, even if Vancouver has lately been showing itself from its very authentic side as far as weather goes, there were tons of opportunities to enjoy ourselves in the last 168 hours. I guess I personally covered almost all the hours dedicated to ‘fun’ in Whistler last weekend and rather took it easy during the week for this reason. So last Saturday, a group of 16 INTERNeX-ers and friends headed north to the beautifully fall-like village of Whistler. We spent our time eating, shopping, hot-tubbing, drinking, partying, bungee jumping and just hanging out at the lodge. We, the PR-team, were glad everyone had such an awesome time and we all got back to Vancouver safe and sound but tired on Sunday night. Check out the full report on what we did in our INTERNeX blog. After three days of work I was definitely ready for another PuB NiGHT, though – I’m telling you. 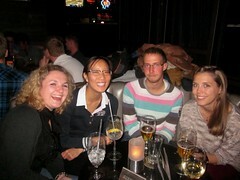 The Cinema Public House on Granville St was the perfect location for a chill night with almost 20 people attending. 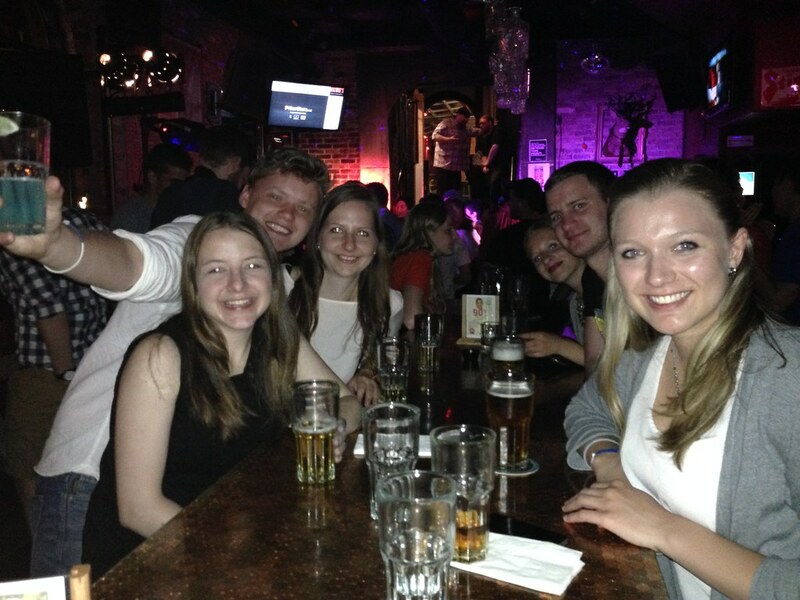 We enjoyed wine, cocktail and beer specials before I called it a day comparatively early this time (not very typical of me, I know ;)). I’m sure the others stayed way longer and maybe even put on a fussball (=table soccer) tournament or something.